It’s fall. Or autumn, depending on where you are in the world. Things are calming down on the school front — we’re settling into the 5-th grade routine, with common core and all it entails. During summer when school is out, life moves at breakneck speed with work, activities, vacations. Wild, considering summer’s for relaxation. But no, we’re crazy busy. I’m sure you know the feeling. So, it’s nice to slow down. At least until the winter holidays hit with the force of a blizzard, but let’s not think about that quite yet. Last night I found myself slowing way down. In the silence of the night, I read for a good hour or two. While I have an intriguing Brad Thor thriller, I took a break from the international action and turned to the latest issue of the Red Fez Magazine — one of my favorite small presses. The Red Fez editor had sent an invitation to submit for their October issue. So, I did. A story titled IOANA, one dear to my heart as it’s the first such story set in my native country of Romania (at least the first written in English). But there’s more: this issue is full of good stories, poetry, art, photos, comics, music & videos. Just what an insomniac needs. Thoughts of the next day, of relieving the past, all kinds of pesky thoughts fought for my attention, but I let them pulverize in the night mist. I slowed way down — just read — and everything was a-OK.
~~~ How do you give yourself headspace to simply enjoy life, to savor and appreciate each moment? 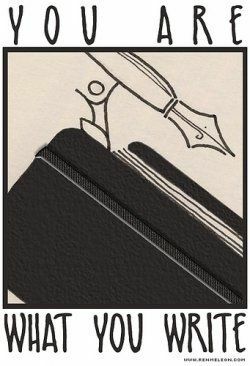 “In the writing process, the more a story cooks, the better.” ~ Doris Lessing. The amazing Guilie Castillo Oriard invited me to join in My Writing Process tour, which introduces you to writers and gives a little insight into their writing process. Please, hop over to Guilie’s blog, Quiet Laughter. She’s working on a year-long project for Pure Slush — great stories from all around the world. By the way, I’m early with this post (due Monday). Considering the A-Z Challenge is almost here, things move a little faster. Actively, I’m working on a mystery titled Old Wounds, but I’m also putting the finishing touches (yet again) on my novel, Stranger or Friend. This one refuses to leave me alone. Too much internal thought slows the pace, and we can’t have that. Not enough, and I no longer recognize the characters, so striking the perfect balance … well, life is complicated and I like it that way. The end, however, is in sight. I can almost see it. After having a second story published by Red Fez, I became greedy. Carved out more time for a couple of shorts. It seems I can’t work on a single project. There is comfort to be had in studies that link a wandering mind to the creative process. I think. I really don’t know. Others suggests something similar, and works are different within any genre. A writer friend concluded my novel is not your regular mystery or suspense, but perhaps more on the women/literary/mystery side. I like that. Must be the internal monologue — the characters’ emotions. Because emotion (done well, not the sappy kind) lies at the heart of a good story. Without it, I might as well populate my story with robots — nothing wrong with robots, just a personal preference. Why, oh, why? For my novels, mystery is what I find engaging on story and character level — presenting the reader with a series of problems and questions, which arouse feelings that are often beyond imagination, yet seem real. Short fiction is, in some ways, like a photograph — a captured moment of time, sometimes mysterious, fascinating, though perhaps delicate. It encapsulates the sense of wonder that feels our hearts, our fears and secrets. This complexity needs unmasking, and that’s what short stories are for. I sit down and write, write, write. Usually when the house is quiet, so I can focus. I stare out the window for long durations. Maybe I’m crazy. But if I were crazy, I’d consider that normal, right? See where this is going? I put together a few general ideas, even try to imagine the ending, but I don’t do an elaborate outline or advanced plotting. Sure, I have a sense of direction, the main details. But that’s about it. And the non-plotting has nothing to do with killing creativity. It’s been my modus operandi for so long, switching gears now would drive the whole thing into a tree. Here is the beauty of the process: there isn’t — nor should there ever be — a one-fits-all formula. This is writing, after all, not math. And that, my friends, is how I do it. Again, many thanks to Guilie for inviting me to play. As is tradition, I’m tagging two writers to share their stories next Monday or any other Monday: my dear friend Debi O’Neille, and my friend and former writing partner Linda Covella (who recently signed a publishing contract with Astraea Press). 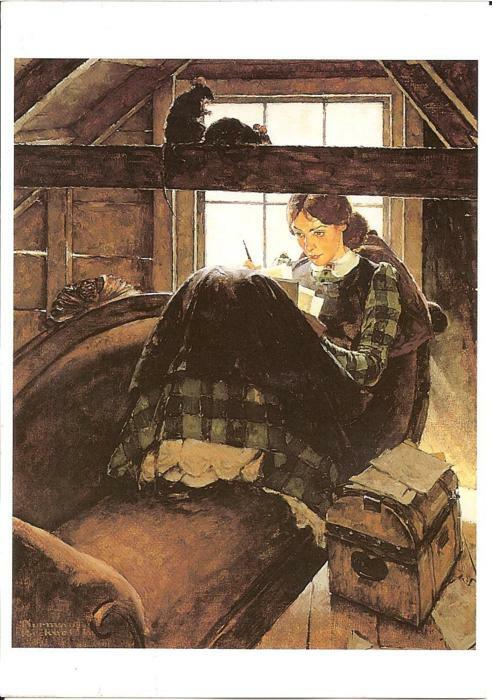 Images: Norman Rockwell’s Jo, bloggingthemoments.com; Paul Cubitt, Pinterest. My short story “The Friend” — a take on friendship gone wrong and a mother’s fight — is up at Red Fez, a Literary Magazine, today. Photo courtesy: The AMICA Library, Gift of Mrs. J. Wolf in mem of Miss Rachel Able, Wikimedia, CC.